Located in Western Africa, Côte d'Ivoire Republic (La République de Côte d'Ivoire, French) borders the North Atlantic Ocean, Liberia, Guinea, Mali, Burkina Faso, Ghana, and the Gulf of Guinea. It is a little larger than the state of New Mexico. Its climate is tropical along the coasts, but semi-arid in the far north. It possesses some significant natural resources, including bauxite, cocoa, copper, petroleum, natural gas, diamond, manganese, iron ore, and hydropower. Since gaining its political independence from France, on August 7, 1960 it has acquired a steady, but insufficient, flow of foreign direct and indirect investment funds particularly from the ex-French metropolis. Its export-led strategies, primarily dependent on the cocoa production, have triggered consistent economic growth but not necessarily harmonious socio-economic development outcomes. The severe decline in cocoa prices in 1999 and 2000, coupled with the first military coup d'état since 1960 and the exclusion from the October 2000 national elections of opposition leader Alassane Outtarra produced violence and political turmoil. After this election, Mr. Laurent Gbagbo replaced Mr. Robert Guei, ending 10 months of military dictatorial control. The population of Côte d'Ivoire in the early 21st century was approximately 16.5 million, but AIDS has ravaged the nation, killing 72,000 Ivorians in 1999 alone. The average life expectancy in the early 21st century was only 45 years. The country has absorbed many refugees from neighboring countries, particularly Liberia. Ethnically, Akans represented Ivorians at 42 percent, Gurs or Voltaiques at 18 percent, Mandes (North and South) at 26.5 percent, and Krous at 11 percent. Religiously, 34 percent of the Ivorians were Christians, 27 percent Muslim, and 15 percent Animist. The official language is French but some 60 dialects are spoken, predominantly Dioula, and the literacy rate has remained above the world average, at about 50 percent. The mass media and press system in Côte d'Ivoire has remained fundamentally French, as in numerous ex-colonies of Western European powers. In the early 21st century, there was a very low daily newspaper circulation of 16 per 1,000 people compared to 228 per 1000 in the USA, 237 per 1000 in France, or 14 per 1000 in Liberia. 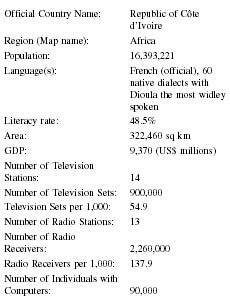 This was despite the existence of 12 major daily newspapers, including Fraternié-Matin and Ivoire-Soir (government-owned), La Nouvelle République , Le Jour, AFP-Côte d'IvoireAllAfricaIRIN , and Abidjan Net. 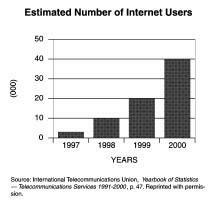 Other statistics recorded one television set per 17 people, one radio set per seven people, and one telephone per 123 people. The Ivorian real (adjusted for inflation) GDP amounted in 2000 to slightly over $26 billion. The real GDP per capita, in addition, was a low $1600. The GDP was 32 percent based on agriculture, 18 percent on industry, and 50 percent on services. The labor force remained mostly absorbed by agriculture at the beginning of the 21st century, as Côte d'Ivoire has continued to be a major world producer and exporter of beans, cocoa, coffee, and palm oil. The Ivorian economy is at the mercy of world commodity price variations, climate, and internal and external politics. Public revenues in 2000 were $1.5 billion while public expenditures were some $2.1 billion. Official unemployment was at a high 13 percent. Exports amounted to about $4 billion and imports added up to $2.5 billion. Again, cocoa represented the lion's share of the exported goods at about 35% while consumer goods, capital products, transport material, and fuel were the main imports. At the wake of major protests by students and workers in February 1990, against President Félix Houphouët-Boigny, the first ever-democratic multiparty elections were held in October 1990. Although Mr. Boigny retained his office, the Ivorian National Assembly introduced gradual media and press legislation to promote freedom of the press, freedom of information, and non-censorship, at least in principle. Factually, censorship still reigns as Côte d'Ivoire remains unsure due to political instability, the plummeting of world prices, AIDS, and an enormous influx of refugees from neighboring countries. Laws and ordinances have been introduced to fight the spread of AIDS, poverty, the uneven regional development, child labor exploitation and slavery, and discrimination. The major Ivorian press and the Internet are paramount to the goals of the new government. Telco, a quasi-monopoly partially owned by the state, is legally encouraged to engage broadcast media, press, other mass media, and journalists and news operators to embark on the Internet to promote social and economic justice. services. The electronic media was extremely weak, though the political, administrative, financial, and academic structures were beginning to acquire and use cyberspace and information technology, particularly in the capital, Abidjan. Some major web sites include those of the Ivorian President, the Ministry of Culture, the National Office of Tourism, the Front Populaire Ivoirian, Agence France Presse, and several major newspapers. The Ivorian people have generally been open to foreign media, usually French. The successive governments, since the 1960 post-colonial régimes of Boigny, Bedié, Guei, and Gbagbo have varied in their perceptions, authorizations, and usage of the foreign press and media. In the years 2000 and 2001, Côte d'Ivoire saw its worst political nightmares, as opposition leader Alassane Ouattara was illegally excluded from the October 2000 elections. In fact, following the Supreme Court decision to exclude Ouattara, the streets of Abidjan were the scene of unprecedented violence. Relations with the foreign media, therefore, were tense and exclusionary. The UN, the EEC, and the OAU refused to assist with the parliamentary and presidential elections. Other protests, governmental and media, ensued from France, South Africa, Senegal, Morocco, and many others. Gradually, however, since Mr. Gbagbo took over in October 2000, replacing the military junta and dictatorship of 10 months, the country has begun to return to democratic internal press and media usage, and external media and press cooperation. Many journalists in Côte d'Ivoire are educated and trained in France, principally in colleges, universities, and journalism schools in Paris, Lyon, and Bordeaux. A few are trained in Western and North-African countries, such as at L'Université de Dakar in Senegal and l'Université Mohammed V in Rabat, Morocco. Abidjanis becoming a major educational and training center for journalists, news anchors, and photojournalists. afrol.com . Available from www.afrol.com/Countries/CIV/news_civ.html . "Cote d'Ivoire," CIA World Fact Book 2001. Available from http://www.cia.gov . Sarri, Samuel. Ethics of the International Monetary Systems . UPA: New York, 1998. The World Almanac and Book of Facts, 1995 through 2001 . K-III Reference Co.: New Jersey. Thanks for posting this, very informative and useful! Does anyone know the amount of cars per 1,000 people?